(NationalSecurity.news) Over the weekend the Washington Post and The New York Times both reported that “anonymous sources” within the CIA believe that Russia interfered in the U.S. presidential election, largely by hacking into Democratic National Committee and Clinton campaign computers, and by feeding propaganda to about 200 American-based news and information web sites. But there is still no hard evidence that anyone can produce, a full reading of the Post story reveals. American intelligence agencies have concluded with “high confidence” that Russia acted covertly in the latter stages of the presidential campaign to harm Hillary Clinton’s chances and promote Donald J. Trump, according to senior administration officials. But there is still no hard evidence that anyone can produce, a full reading of the Times story reveals. The Trump transition team has, of course, lambasted both of these reports, saying essentially that they are from the same intelligence apparatus that claimed, incorrectly, that Saddam Hussein’s Iraq held weapons of mass destruction. But aside from the political perspective, here is why these reports are very suspect and, indeed, could be propaganda themselves aimed solely at undermining the incoming Trump administration. — The reporters and editorial boards of both papers were in the tank for Democratic presidential nominee Hillary Clinton, despite the fact that both papers did indeed report on much of the hacked information gleaned from the DNC and her campaign. Both editorial boards endorsed her (the Post here; the Times here). — The Post ran with a story recently based on obviously shoddy information from an anonymous group no one had ever heard of, which claimed that Moscow used hundreds of U.S.-based web sites to spread false propaganda about Clinton, to the benefit of Trump. No one else would touch this story and for good reason: It was garbage. The Post was even forced to print a sort-of retraction. Reliably Left-leaning online investigative news site The Intercept, whose co-founder Glenn Greenwald broke the Edward Snowden series with the Post, was even highly critical. — The mainstream media, which was also largely in Clinton’s corner, has attempted to craft the “fake news” narrative out of whole cloth since her loss, without a shred of evidence or proof that the negative reports circulating about Clinton, her foundation’s shady foreign dealings and her husband’s past sexual dalliances prior to the election were fabricated. This is a crucially important question for a number of reasons. First, there is the matter of Clinton’s unauthorized use of a personal email server during her tenure as secretary of state. FBI Director James Comey said his agents believe with 99 percent certainty that her server was hacked by several foreign governments; Russia certainly has the capability to do so, and as such any good intelligence analyst worth his/her salt would have to assume that Moscow is one of the countries the FBI believes hacked the Clinton servers. After all, we are attempting to hack Russian (and Iranian, and Chinese, and a host of other countries) intelligence data bases all the time. Secondly, as The Daily Caller noted, the Times’ declaration that the Republican National Committee’s servers were similarly hacked by Russian intermediaries—but that the hackers chose not to release any RNC information, thus “proving” Moscow was helping Trump—is itself a fabrication. According to RNC spokesman Sean Spicer, the organization is working with U.S. intelligence agencies who have concluded that no, the RNC’s servers were not hacked. And there is this: Julian Assange of WikiLeaks has stated, publicly, that Russia was not behind the DNC/Clinton campaign hacks. Granted, Assange made his statement on RT (Russia Today), a media organ controlled by Moscow. But hang on; there’s more. It’s very fair to say that Russia was likely among the five or six countries the FBI believes hacked into Clinton’s personal email server while at State; so why shouldn’t we also believe that Moscow hacked into the DNC and the Clinton campaign, but not the RNC? That helps explain his hack of her State-related email servers and, perhaps, even the hacks the DNC and the Clinton campaign. But it doesn’t help explain the resulting release of the hacked data because it was all clearly damaging to her and her political party. And the releases of hacked information seemed to be an effort to keep her out of the White House. That doesn’t make sense. 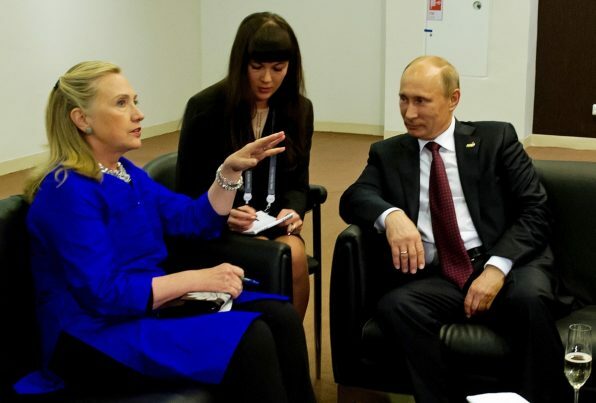 After all, if you’ve got the goods on a U.S. president—and let’s not forget that the Clintons were also instrumental in helping Russia secure 20 percent of all U.S. strategic uranium reserves—you would keep those cards close to your vest because that would be a huge diplomatic and foreign policy advantage for Russia. If Putin has all this stuff on Clinton, he could essentially dictate U.S. foreign policy as it pertained to Russian interests. By comparison, a Donald Trump presidency featuring billionaire businessman with zero political influence or experience, and no skeletons remaining in the closet after a bruising campaign cycle, does not offer strategic advantages to Putin. A Trump administration, especially one whose Cabinet is permeated with hawks, offers a much greater challenge to Putin on the world stage than would a compromised Hillary Clinton. While we can only assume what the motivations are for the Post and the Times (and, possibly, some in the U.S. intelligence community) in pushing their narrative that Russia was somehow overly influential in the U.S. presidential election, what is far easier to deduce, with some thought, is that it just doesn’t add up. This narrative also assumes two additional things: 1) Trump, by himself, is incapable of convincing enough voters in enough key states to support him; and 2) the CIA is completely devoid of careerist officials who don’t themselves have a political agenda. Neither of these assumptions can be accurately made.